The Father says today, follow Me where I take you. Even though I take you through the eye of the needle, I will yet enlarge you and increase you with all My good promises. Grieve not over the people, situations and things that you cannot take where I am bringing you. When you seek My kingdom – all things are added. I will add to you and add to you until there is no room left to receive those things that I am blessing you with. The path is narrow beloved. Though the path be narrow and all cannot go, know this that you will come into your blessing place. In fact, as you asked and prayed and prayed this narrow place walking is what you were asking for. When you were under pressure and cried out “I didn’t ask for this!” that was not true. You asked for My best and My highest for your life and My love – this is the path that brings you there. Receive the carrying of the cross of obedience. Even as I carried My cross so you are to carry your cross. The cross you carry is a cross but it is still yoke easy and burden light. I took the heavy lifting. You are never called to carry something that I died to take off of you. That isn’t what men have taught but their words are false toward Me. I never give you sickness because I died to remove sickness far from you. I never give you rejection for I was rejected that you might be accepted. I never give you poverty because I became poor so that you could be rich. Believe the good report, says the Father and accept the narrow path and the eye of the needle that I might bring you to all that I have for you this day. This surely spoke to me.. tears down my face in a workroom beside my classroom. I’ve been re-reading it over and over since then. Thank you Lord. I accept the narrow path and by your grace how can walk in it! I give thanks and praise according to Matthew 11:30 that your yoke is easy! I “need” that! Amen! Amen!! This path is sooo narrow Lord! Give me the strength to keep moving! Thank you Father I receive all that you have for me on this day and everyday of my life. You words every morning I wake up have influenced me greatly and my perception of God has been transformed. As I read the email each morning, I feel like you are speaking to me and my situation. Many times, God has picked a word from your prophecy and extended it to give me a word for my readers. Not once. I hear your words repeating in my heart. These are true words from God that I encourage others to subscribe to. Thanks for sharing your LOVE to overflowing with your words spoken over me today. Where you lead I will follow Father. I receive this in Jesus name. Amen. I accept. Thank you Father God. Wow! This is for me today! =) yes Lord, yes Lord….Yes Lord I accept, with my Camels going thru the eye of the needle…thank you for your blessings, provisionins, protection, healings, joy & your Love…. Thank you Father! You are my good, good Daddy! for All good works in you. I thank thee. I honor thee. Hallelujah, to you my Daddy. Amen. 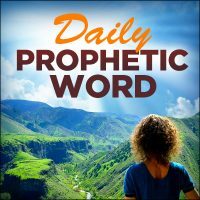 « Morning Light June 7th, 2017 – Jeremiah 35: When Should We Disobey the Prophets?